Science is NOT a vote nor a consensus. Science, like facts, are what they are with or without your opinions. You can smell the fishy red-herring smell in alarmists attempt to shut down all opposing debate. True science welcomes debate! Is CO2 the main engine of Climate Change? Doubtful based on earth history. Is it man caused? Maybe, but not likely due to the facts such as water vapor being the main green house gas, NOT just CO2, not to mention CO2 levels are still not even close to optimum levels required for plants or what they have been in the past!! Then ask yourself the question, even if this were true, why cause more poverty by making fuel costs higher, which hurt the poor among us far more than the wealthy. As well since CO2 levels are still not even at their optimum levels and since it is a proven fact that higher CO2 levels will increase crop yields, this too will more help the poorest among us, especially in 3rd World countries (I know this from my ongoing field of studies). How those who claim to support the poor such as the Socialist Bernie Sanders can support measures to combat a likely hoax or at most something we have no power over shows extreme hypocrisy. Are those who challenge some of the facts as put forth, many already proven fabricated, Deniers? No this is an inflammatory statement (logical fallacy) meant to shut down debate. 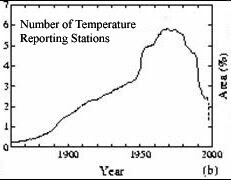 Here is a YouTube video series that traces the history of the man made global warming hysteria, which actually started with Global Cooling. It is always good to look at the history of any conspiracy theory or movement such as this, to understand where the truths might lie. Even if you support the concept of man-made global warming, this video series is a must watch. "The 97% "consensus" study, Cook et al. (2013) has been thoroughly refuted in scholarly peer-reviewed journals, by major news media, public policy organizations and think tanks, highly credentialed scientists and extensively in the climate blogosphere. The shoddy methodology of Cook's study has been shown to be so fatally flawed that well known climate scientists have publicly spoken out against it." 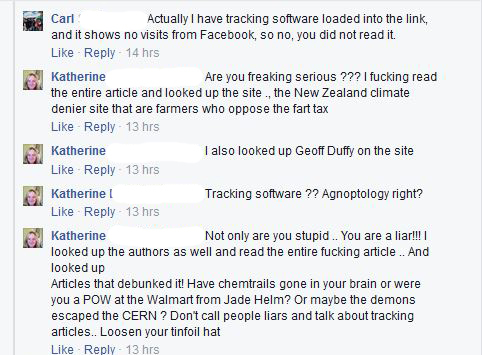 As an example, a very hateful person attacked me in Facebook, citing me as an example of Agnotology even though as these peer reviewed articles point out that Agnotology is a double edged sword. 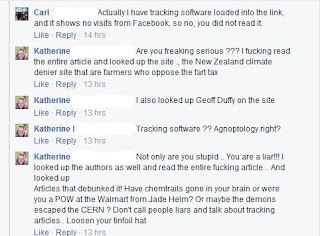 This person even acted like I was from another planet when pointed out I knew she was lying based on tracking software embedded in this and other articles I host. Sorry lady, but this quite a common practice in business to see who actually reads, what they read, how much, etc. so as to better target audiences or even simply to discern honesty as I did here. The Screen Shot below displays the hate those who simply want to debate the facts are up against. We also know that respected scientists such Harold Lewis have resigned from the American Physical Society in protest citing "corruption" from "the money flood" of government grants. His letter of resignation characterized the APS as having changed from an organization that seeks to further scientific knowledge, to an organization that suppresses science in its attempt to obtain further funding from government agencies. Please read on, including the updates, and references at the end!! Please note that there are now several updates before the original content starts. "This is how the global warming alarmist community thinks. It wants to frighten, intimidate and then assume command. It needs a "crisis" to take advantage of, a hobgoblin to menace the people, so that they will beg for protection from the imaginary threat. The alarmists' "better world" is one in which they rule a global welfare state. They've admitted this themselves." 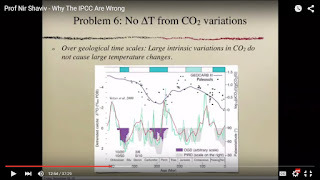 An excellent video by Professor Nir Shaviv, with help from his university students shows many very scientific details as to what does and does not warm the climate. From CO2, the sun, the oceans, to solar radiation and much more. For those interested with an honest open mind, this is a must watch video and well worth your 37 minutes. "The NOAA is notorious for adjusting raw data for political purposes – in order to exaggerate “global warming”. And so it would appear to be the case with Alaska. Barrow, whose 5 degrees F warming has completely skewed the average. But Barrow – whose population grew from 300 in 1900 to 4600 in 2000 – is vulnerable to the Urban Heat Island effect. That is, its recent weather station readings have been artificially warmed by the heat from the town. And instead of adjusting for this, NOAA was caught out – again by Paul Homewood – doing the exact opposite: fiddling the data in order to exaggerate the supposed global warming in the area. Remove the distorted and unreliable Barrow figures from the data and the average cooling since 1977 would be considerably greater than that paltry -0.1 degrees F.
As for that phrase of the President’s about “the impacts here are very real”: presumably, he meant those tragically melting glaciers, like the Exit Glacier he visited in a publicity stunt with Bear Grylls. Yes, the glaciers of Alaska may be retreating. But this has nothing whatsoever due to man-made global warming. We know this because they began their retreat in about 1770 AD long before anthropogenic carbon-dioxide emissions could have made any plausible difference to climate." More evidence is mounting that we need a real debate, not the institutionalized bullying of calling those who disagree with Man-Made Global Warming "Deniers". "The optimum CO2 level for plant growth is 1,500 parts per million (ppm), almost four times the current level, says Dr. Moore. It was 3,000 ppm 150 million years ago (dino industry, I guess), but since that time it had been gradually used up by plants until it declined to a mere 280 ppm prior to the Industrial Revolution. Had this trend not reversed, the CO2 “level would have become too low to support life on Earth,” writes Moore. In fact, he credits man’s fossil fuel use and clearing of land for agriculture with boosting the gas “from its lowest level in the history of the Earth back to 400 parts per million today"
I can state that in my profession, we add CO2 to increase plant growth, the more plant growth, the more CO2 needed, SIMPLE! "When future generations look back on the global-warming scare of the past 30 years, nothing will shock them more than the extent to which the official temperature records – on which the entire panic ultimately rested – were systematically “adjusted” to show the Earth as having warmed much more than the actual data justified. One of the first examples of these “adjustments” was exposed in 2007 by the statistician Steve McIntyre, when he discovered a paper published in 1987 by James Hansen, the scientist (later turned fanatical climate activist) who for many years ran Giss. Hansen’s original graph showed temperatures in the Arctic as having been much higher around 1940 than at any time since. But as Homewood reveals in his blog post, “Temperature adjustments transform Arctic history”, Giss has turned this upside down. Arctic temperatures from that time have been lowered so much that that they are now dwarfed by those of the past 20 years." More lies debunked that are pushed by our dishonest news media and Obama. Once again the dishonest main stream media is reporting only what fits their socialist agenda while ignoring other more in depth reports/studies that do not fit this template. Yet these bone heads at ABC et al ran with this flawed report because much of the USA has been hotter than normal since last winter. What was was missed by these dishonest news reporters is that Europe, Asia, and even Alaska actually had one of the most severe winters in recent history. This study was was not mentioned at all by the media slime since it did not meet with their socialist propaganda, unlike the much more limited NOAA report. FINALLY; what was also never noted (which is simple connecting of the dots) is we are currently at the peak of solar flare cycles. As well we are in the second year of a strong "La-Nina" event! With this in mind, for these socialists who give far too much credit to man to think our CO2 emissions have as much impact as the Sun which emits more energy in a day that we have in human history is utter idiocy. In reading either study, I do not think any honest person can make an absolute conclusion for or against man-made global warming, which is really the point of this article/post. What I and many others object to is the dogmatic almost al-Qaeda like belief in "man made global warming", where by this theory is treated as a fact and anyone who disagrees is an enemy of the state or infidel. "Climate study confirms what skeptics scoffed at: global warming is real". Bluntly both sides of this argument can manipulate the data, but what this Man-Made Global Warming Crowd is doing is to ONLY USE URBAN DATA then extrapolate this to raw rural data that actually shows cooling. As well many fewer "reporting stations" are now used to prove their misguided points. Finally only data from the Northern Hemisphere is often used, ignoring data in the Southern Hemisphere that shows cooling. From my reading of this I get an honest unbiased explanation of how the "numbers" are arrived at, readers can draw their own conclusions (which may well be to believe the Man-Made Global Warming assertions). Further so-called news media misinformation is simple, these persons such as Sam Champion use the "look out their own window" method and seem almost giddy to report how much of the USA is having a much warmer than normal winter for 2012 (which is indeed true), however there inference that this applies to the rest of the Northern Hemisphere is simply bunk. 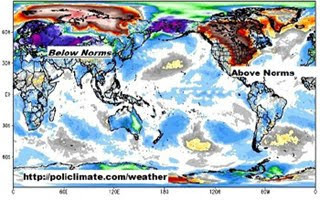 The facts are Asia and Europe are having one of the worst winters in a century (Alaska is part of this extreme cold wave too, so tell the citizens there about Global Warming). Of coarse the real point is that neither the extreme cold in most of the Northern Hemisphere proves global cooling nor the unusually warm winter in the USA proves global warming. The clear facts are for anyone is that man-made global warming is hypothesis at best. What is truth is that the climate does change, which of course has been happening for eons, long before man and is something we and other inhabitants of this planet need to adapt to whether it be warming or cooling. I will also put forth that no thinking person is advocating unnecessary pollution, as we are all stewards of this planet and should do our best to live our lives in a way that does not leave our mark on this planet other than maybe being "cleaner" than when we entered the world. However living in caves and grazing on grasses so as to not produce even CO2 is the extreme many would seem to have us do. Climategate 2.0? More Emails Leaked From Climate Researchers. I constantly have heard/read that the “scientific consensus” is that Man Made Global Warming is True, HOWEVER I should point out that true science is NOT based on consensus, rather controlled tests that put in place many variables along with controls. Science is NOT up for a vote. Most scientists thought the world was flat a few centuries back, did this make this true? While meteorology/climate study is just a hobby/interest for me. my actual field of professional endeavor is aquarium/pond keeping. I have spent over 35 years in research that includes controlled tests that proved many popular myths untrue whether it be the “watt per gallon myth for planted or reef aquarium lighting. As well I have much time disputing the many claims about certain medications, such as Erythromycin curing their fish of Columnaris when controlled tests prove this false. The problem is that in these anecdotal claims many will not consider the many variables (such as water changes and other procedures that equipped the fish to fight the disease better due to improved environment or simply the disease was not the disease that they claimed it was). My point in getting somewhat off subject is that it is easy to make claims with anecdotal observations or doctored tests and in my industry this is an extreme problem and I suspect that this same problem exists in the Global Warming Myth pusher industry (which in part is made up of socialists that hate American Prosperity or often simply persons with much monetarily to gain from this hoax). I have already read/heard many attacks on the whistle blowers. Why is Not OK to blow the whistle here on the Global Warming Hoax Pushers while it is OK to blow the whistle based on lame comments such as it is “the seriousness of the charges” when made by liberal/socialist groups or media. This is totally hypocritical and is also how many DHS/DCS government agencies act with no regard to families that they may destroy. Also, all of this information was subject to Freedom of Information requests, and they were deleting information that would harm them. They were deleting information and fighting the release. These emails also expose bullying of those who disagree with the politically correct mantra of the Global Warming Hoax by scientists who dare argue the so-called facts. Similar to the kind of email bullying that goes on in my industry by Reef Central, AquaTop, and more. One example of manipulating data to attempt prove incorrect theories was the use Yamal trees in Siberia that formed the basis for revising the 2,000-year-old temperature record, the number of trees used were three. The global warming scientists used the rings of THREE trees, and they cherry-picked those three trees to prove what they wanted to be able to prove, and they ignored other trees which did not establish what they were trying to prove. They took three trees. That’s all they could find. Three trees perpetrated a global warming hoax at every university in this country. It is also noteworthy that the Earth hits its peak temperature at the end of the last millennium and is now cooling. Sulfur Dioxide is a pollutant that we should be more worried about as this is not only unhealthy to breath, it has been more scientifically proven to cause Global Cooling and many countries such as China dump copious amounts of this pollutant into our atmosphere. Man made versus Natural Causes: While there is no denying global warming, what most miss is the cause and effect of CO2 in that there is always a lag in CO2 from warming and while admittedly the CO2 produced will then warm and produce even more CO2 (via degassing of Oceans), there are other processes that counteract CO2 such as plant photosynthesis (which I can demonstrate on a small scale in an aquarium by artificially adding CO2 at a much higher percentage than is currently in the atmosphere). CO2 is a very minor part of our atmosphere (0.0384% as of 2007) and even with the increase (which no honest person denies), it will have little impact on global temperatures as stated above water vapor is much more common and effective Green House Gas. One Volcanic eruption can dump vastly more CO2 than 100 years of man made CO2. Many sites such as Skeptical Science will provide small fragments such as the already discredited tree ring date from Siberia to attempt to prove their points as to “man caused”, while missing the big picture of the normal ebb and flow and more significant causes such as solar activity. Sadly besides the obvious socialist underpinnings of the man made global warming hoax, it is also clear to me (& others) that this is also a case of persons placing way to much significance on our powers and abilities when is reality we are so insignificant in terms of the powers around us on this planet or the universe (whether believe in a Supreme Being or not). This is not to say we should pollute or simply waste, as others who have known me throughout my life know that I have recycled everything (I have had a compost pile for almost 30 years now). However I also realize that while this is important for a clean community/planet and cutting carbon monoxide is important for our health, the Man Made Global Warming Hoax is a far cry from good stewardship of our natural resources, it is simply a socialist take over of our economy and a way to tax us further into oblivion. Sadly much of the lies about Global Warming/Climate Change are easily defeated by common sense, unfortunately the news media has so many otherwise open minded persons thinking like robots. 1. Science does not understand nor is it interested in words like capitalist, socialist, communist. The validity of a theory is based on the scientific method, not religious or political orientation. 2. Scientists rarely use the phrase "100% certain," but rather state their findings in terms of probability. Those who believe global climate change is highly affected by man are likely to use phrases like "highly probable." The fact that they DON'T use phrases like "100% certain" does not diminish the validity of their statements one iota. 3. Scientists change their "opinions" with some frequency. Had he been asked, Newton would likely have said "My equations are the BEST currently known explanation for the observable universe." His theory was not altogether thrown out by Einstein's work. Rather, the validity of Newton's theory is confirmed (in many situations) to be a subset of Einstein's theory. Most theories get better, not reversed. 4. At any given time, there is a "best known theory." With respect to man's influence on climate change, it currently runs counter to what you are espousing, Carl. Your laudable career in aquatics does NOT trump the majority of the world's scientists. FYI, anyone's suggestion that there is no majority is somewhere between lie and delusion. 5. My current source for the BEST explanations is neither you nor any other individual. See here: http://www.ipcc.ch/pdf/assessment-report/ar5/syr/SYR_AR5_SPMcorr2.pdf. 6. It is of absolutely NO concern to me that adherence to proper world husbandry may cause the US (or any other country) to suffer economically. Many atheists and especially Judeo-Christian believers believe that wealth is no indicator of righteousness. I am of Jewish heritage, well schooled in that faith, and can ASSURE YOU that mankind is expected to be a caretaker of the earth, not a master of it. As a member of the "team" that has proportionately brought more scientists into this world than any other identifiable group, let me assure you that proper science trumps all other amateurish belief sets. 8. My sole reason for injecting religion into this discussion is to demonstrate that the acceptance of proper scientific method is not equivalent to atheistic beliefs. By no means would I cite any scripture in any "holy book" to make a scientific point. I just want to comfort those who do have faith. They are not devil-worshippers simply because they accept science. Similarly, a conservative can believe in science without compromising his political beliefs. I think you need to read my evidence that supports these arguments as clearly you have not done this as you have in the past. As well the money trail speaks to why so many scientists support this flawed theory. You note theology about taking care of the planet. I fully agree and IF YOU KNEW ME BETTER you would have never made such a condescending statement as I have been one to recycle and support all sorts of environmental causes (I was a Democrat before life events made me re-examine who I supported and who really was honest with me and you are clearly helping me confirm this past decision). Honestly after reading this I have to wonder if this type of condescension making personal assumptions without knowing the facts is how you go through life? VERY INSULTING! However I would not put a cause ahead of taking care of my family and neighbors with this theory does. This is similar to how my County (Josephine) has been put in the red by shutting down the logging industry to protect just one species. Persons have had their lives and families devastated by this. Ditto the made global warming crowd and the expenses piled onto businesses such as my own for a questionable cause, unlike smog control, water pollution, etc. While I appreciate your commending my work in aquarium keeping, much of my understanding of science has gotten me where I am now and it is frankly insulting the way you mask your compliment in a insult that I really do not know what I am speaking about when I cite plenty of references and have plenty of practical scientific experience. What is also interesting as per the comparison how the media and left act toward those who have issues with the truth of man made global warming and how persons respond to my articles in never addressing the facts presented. Instead using the tired argument that most scientists agree is that this is the EXACT way those who attack me in forums and emails stating that "most aquarium keepers use a certain lighting method” or disagree with my science based information about Redox or UV Sterilization. SORRY, but just because most aquarium keeping forums cannot even understand that energy lost in heat is energy that is not going to light ones aquariums, nor the science proven fact of PUR in photosynthetic life does not make my information, studies, research wrong. Then there is the money trails here too, as most of these forums such as the vile Reef Central are highly supported by EcoTech and other lighting systems that go against the science I have presented. DITTO the man caused global warming theory, follow the money and reject the arguments based on majority rules!!!! To ignore this is to ignore a major piece of the puzzle as many studies over the years have been found corrupted. Suggested Reading as an example of how your disguised snarky comments compare to others. HAVE YOU CONSIDERED HAVING AN OPEN MIND AND SIMPLY READING THE CITED SOURCES? What is also offensive is the fact that you criticize me and my knowledge when my tracking software shows you did NOT click on but even one source I cite. Is this how you treat others you disagree with? This is clearly not respectfully disagreeing!!!! This is so sadly typical of liberals based on my stat software and this includes those who attack my aquarium keeping articles! !